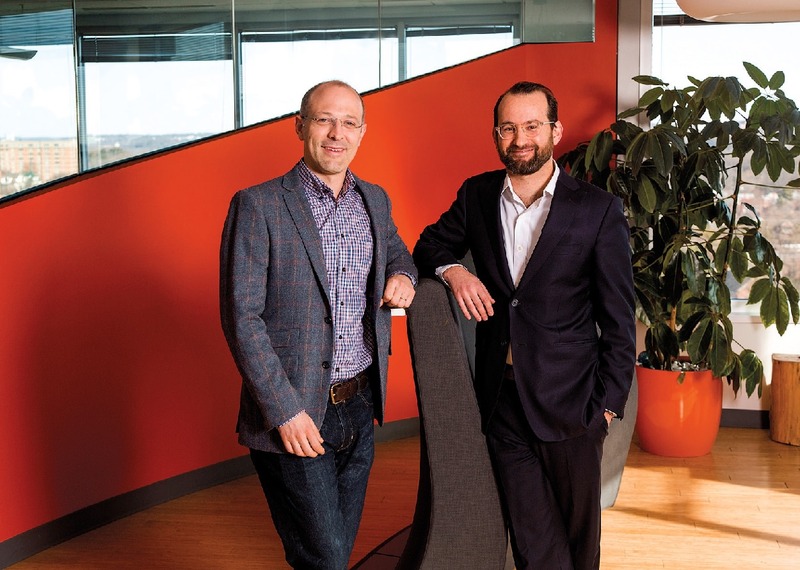 Yates (left) and Laskey have merged their talents—computer science and political communications—in Opower. 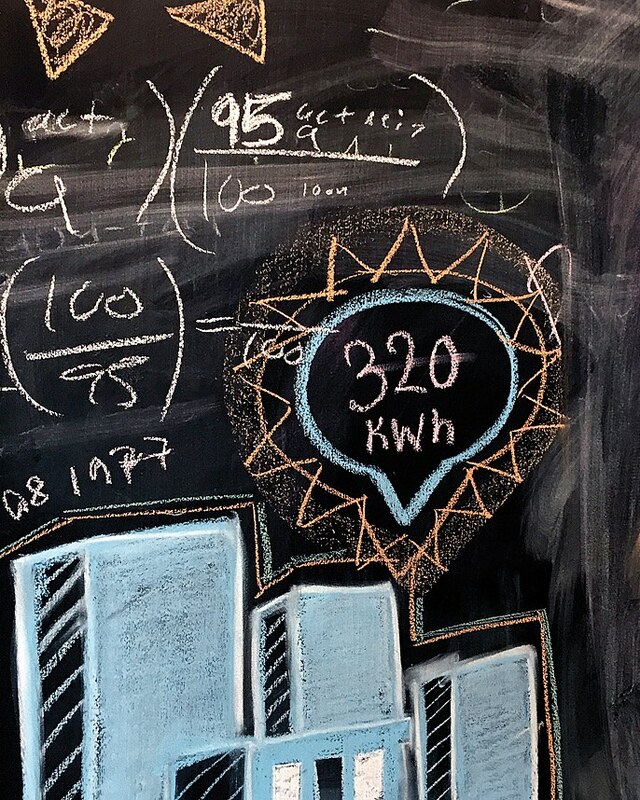 An office blackboard reflects Opower’s effort to encourage creativity. Are you a “Steady Eddy,” “Twin Peaker,” or a “Night Owl”? A software company called Opower has identified what times of the day a large swath of American households typically use the most electricity—and is helping consumers change their usage in order to save power and money. Steady users tend to be home all day, whereas Twin Peakers’ demand spikes in the morning and then again shortly after dinner. Understanding energy use by time of day, place, and household (and probably more personal parameters in the future), enables Opower’s nearly 100 electric-utility clients in the United States, Great Britain, Japan, and other countries, to more precisely target their customers. They can promote customized information and timely messages about how to reduce consumption—the day before that 95-degree heat wave starts, for example—and also thank customers: thus building positive relationships, the critical engagement factor that spurs more energy savings. If consumers save, the utilities and power generators can potentially save even more. Opower does not work directly on the issue of power generation, nor does it “go beyond the meter,” says Yates, as in installing smart devices that record electric energy consumption and send the information back to a utility, or engage in any other hardware solutions. Instead, the company figures out the best ways to measure and manage demand for electricity, and persuade people to change habits, largely by creating lively, gratifying ways to communicate with users. This, in turn, helps their utility clients better maintain reliability, comply with efficiency mandates now in effect in more than 30 states, and spend a lot less to fire up primarily coal-burning generators to meet periods of peak demand. In time, ideally, these interventions will enable the utilities to build fewer new generating plants (whether coal- or natural-gas-burning)—and thus save the companies, their owners, and electricity customers billions of dollars while lessening environmental degradation. Opower has 580 employees and went public last April (and expects to turn a profit in 2017). Like competitors such as C3Energy and Tendril, it is at the forefront of helping traditionally stolid, regulated monopolies transform how they do business and stay viable in the face of multiple threats: flat U.S. demand, public pressure on rates and on the siting of new facilities, challenges of managing intermittent renewable-energy sources and distributed generation (such as rooftop solar panels on homes), and the increasingly complex and uncertain energy markets around the world. Yates would add one more inhibiting factor: “the industry itself.” The resistance is generally the result of “massive installed bases and capital investments built out over almost a century that they are loathe to watch the value deteriorate on,” he adds. (See Harvard scholar Mara Prentiss’s perspective on these issues in “Altering Course,”  page 46.) “They are struggling. And they don’t have a ton of regulatory support to help them transition or to allow innovation. So what we are seeing is that the risk of inaction has now, in most cases, eclipsed the risk of action.” Their effective, efficient operation obviously matters to the economy and society at large. Their brand of more personalized communications is already helping client Baltimore Gas and Electric (BGE) manage what’s called “demand response”: the goal, to reduce peak-use among customers on the hottest days, when air conditioners are blasting. A pilot program there yielded a 5 percent decrease among participating households in 2013 (2014 results have not been released). This summer, the campaign will be extended to more than one million customers. It works like this: the evening before a peak-use day, customers are alerted by text, e-mail, or a phone call and provided with information on their usage compared to their neighbors’, and what they can do to cut consumption (and their bills) during peak hours. The day after the peak event, if a reduction occurred, BGE recognizes the behavioral change and credits a rebate. The system depends on BGE-installed smart meters, which measure and report almost real-time electricity usage, but do not (yet) link use to specific actions, like turning on the air conditioner. Yates and Laskey originally teamed up to find a way to help mitigate environmental degradation. That’s still their overarching goal. They would like to see the big, for-profit utilities be allowed to aggressively compete in the renewables markets (solar, wind, hydroelectric, and other alternative sources of electrical power), Laskey says, if only because those companies already have the distribution system and could potentially operate products and services on a large scale. “The planet and country need them to be in a place to do that,” he explains. “It’s one thing for Tesla electric-car owners to buy their own charging stations, but if we are going to make a dent in climate change, utilities need to be a part of the solution.” A handful of states have required utilities, including some of the bigger, investor-owned companies, to decouple generation from distribution. “Eversource and National Grid, for example, which serve Massachusetts, own very little if any generation,” says Laskey. “So they make their business on maintaining a reliable grid and helping the customer use energy at appropriate times and using less of it, if it’s appropriate.” Whether and how utilities compete in renewable energy remains to be seen. Laskey, the son of a former, longtime Brooklyn district attorney and a public-school teacher, had also planned on a career in public service. “I had no interest in becoming a business person,” the former history of science concentrator notes. He and Yates first met at a freshman-year ice-cream social, were friendly throughout their years in Lowell House, but became close only after reconnecting years later when both were living in San Francisco with their future wives, Rachel Abi Farbiarz (Laskey) ’99, an artist, and Tobie E. Whitman (Yates) ’00, who founded and runs Little Acre Flowers, an environmentally and socially conscious florist. Yates, the son of a U.S. Air Force pilot and a Hebrew-school teacher, was raised largely in California; his parents had grown up poor and “were extremely conservative with resources,” he says. The computer-science concentrator and his classmate Jay Kimmelman co-founded and ran Edusoft, which developed a Web-based, standardized-test performance-assessment tool. After they sold that company to Houghton Mifflin in 2004 for $40 million, Yates took a year off to drive the Pan-American Highway with Whitman—listening to Collapse: How Societies Choose to Fail or Succeed, by Jared Diamond ’58, in the car—and saw former Guatemalan rain forests that are now prairies. Initially, Opower helped its clients send out user-friendly home-energy reports that explained how much energy customers were using compared to their neighbors. Smiley faces reinforced good behavior. They began to see results, and such energy-efficiency campaigns remain a major part of the company’s work: detailed home-energy reports go out to 15 million households. It has since added digital services and improved its behavioral-science methodology for peak-use programs, such as the initiative in Baltimore. In February, Opower announced plans to move further into customer services: longtime client Puget Sound Energy, which serves tech-savvy consumers, will use the company’s consumer data at its call centers to let people know specifically how they are using energy and how they can change to save, like running the dryer at off-peak times. Opower, which will also operate Puget’s billing system, anticipates that this feedback will both improve relationships and allow the company to anticipate and cut down on call volume. Managing demand and expectations go a long way toward smoothing industry transitions such as those that utilities anticipate in California, where state regulations will now require a shift to a “time-of-use pricing scheme.” That’s “essentially a nights-and-weekends package,” says Yates: it offers incentives to use energy at off-peak hours. He and Laskey think utilities anxious about compliance could benefit from having a company like Opower organize communication efforts that will give consumers advance notice of pending changes and peak-use alerts. Yates says reducing California’s peak use by even 3 percent would “significantly reduce the carbon footprint of power plants that California needs to meet its energy demands.” If utilities don’t figure out how to do this, he adds, “They will inevitably do what they have done before, which is ask for a three- to five-year delay [in implementing the new regulations], and that’s a delay” in improving the environment.